1.Crush cardamom pods with a mortar and pestle or the side of a chef’s knife and remove seeds (discard husks). 2.Bring 2 cups water to a boil in a small saucepan. Remove 1 tablespoon of boiling water and use it to steep the saffron. Keep remaining water hot. 3.Heat the ghee in a wok or large skillet over medium-high. Add chopped pistachios and cardamom seeds and stir-fry until the cardamom is fragrant and the pistachios begin to lightly brown, about 1 minute. Reduce heat to medium and add vermicelli. Cook, stirring constantly, until vermicelli is browned and toasted, 3 to 4 minutes. 4.Reduce heat to medium low and add boiling water and steeped saffron. Cook, stirring occasionally, until vermicelli is tender and all the water is absorbed, about 8 minutes. 5.Stir in sugar until dissolved and cook 2 minutes more. 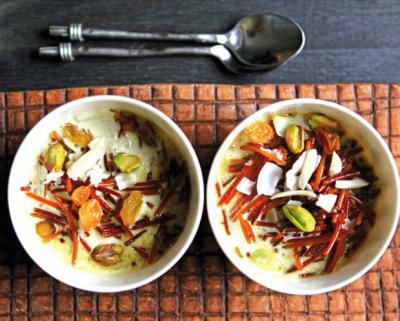 Serve warm topped with the coconut, raisins, almonds, whole pistachios and khoya.